Stampsational: Inspiration from Stampin' Celebration! 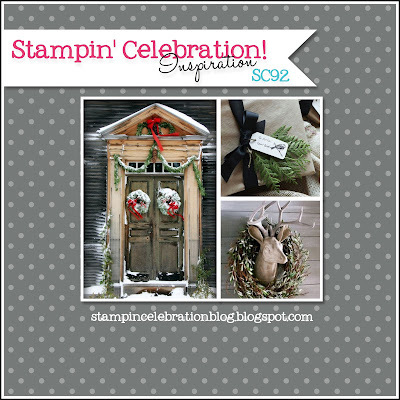 Time for another Stampin' Celebration inspiration challenge. I love, love, love these inspiration challenges. Great way to think outside the box sometimes! Perhaps colors you wouldn't normally put together or a unique way to use stamps and supplies you have. When I saw this month's inspiration I was so excited! Loved the colors, loved the images. I had a hard time limiting my options. But, in the end I came up with something I enjoyed creating! For me, inspiration came in the form of the colors (grays and browns with a touch of red) and the door. Love the door! So I decided to make a card using the Holiday Home photopolymer stamp set (Stampin' Up! 2014 Holiday Catalog) for the main images. I also decided to pull out my aqua painter. There were so many shades of grays and browns that I knew I had to use watercolor to get the right blend and shades of color. Watercoloring is not something I do all the time so this was a bit out of my comfort zone, but certainly something I felt I needed to try! For the background I used the Hardwood background stamp set, versamark on smoky slate cardstock and heat embossed with black embossing powder. Then I took basic gray ink and my aqua painter and shaded in the hardwood design to give it some darker shading. For the houses, I stamped them on watercolor paper using black staz-on ink. Then I used my aqua painter and smoky slate, basic gray, sahara sand and soft suede to color in the houses. I haven't watercolored much so I stamped several of each house so I could practice and use the houses with the right effect. I wanted to try to create the white fluffy wreath so I stamped the little wreath image from the Holiday Home stamp set using versamark and heat embossed it with white embossing powder. The effect was nice but the wreath didn't really show up all that well. Here is one of the houses I didn't use on the card, showing the wreath heat embossed. So, I decided to try making wreaths with white filter paper and the smallest flower on the boho blossoms punch. Viola! It worked beautifully! I punched 4 filter pages at a time and ended up using 8 pieces in all for each wreath, I used a mini brad to keep the wreath together, the end was colored brown using my blendabilities marker to keep with the browns theme. A touch of red with the greeting and a pretty card is ready for the gift giving season! I love how this card came together and hope this has inspired you to do something that might be out of your comfort zone. You never know what you will come up with! Awesome use of aquapainting, wow the wee houses are so cute and whimsical!!!! LOVE this!!! !